A preview of the new scheduling letter for the focused reviews reveals that OFCCP will be asking for a copy of the current AAP for Minorities and Women under Executive Order 11246 in addition to the Section 503 AAP, along with supporting documentation and analyses. Contractors who have already received a Courtesy Scheduling Announcement List (CSAL) letter will be audited based on the existing methodology. However, new scheduling lists, anticipated to go out in early 2019, will include some Section 503 focused reviews. Contractors should ensure their AAPs are up-to-date and that, especially for the AAPs for IWD, evaluation of outreach and recruitment efforts and reasonable accommodation practices are well documented. 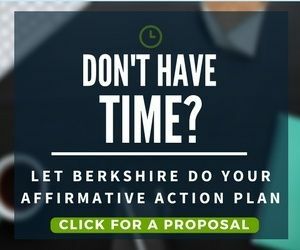 Should you need assistance assessing your organization’s readiness for one of these focused compliance evaluations, feel free to reach out to your Berkshire Consultant.